When we take Lily out for a walk, there are certain places she sniffs and others where she sniffs but also pees. It took me a while, but I’ve now broken the code: this is social media for dogs. Each time she stops and sniffs, she’s reading the messages left by her canine counterparts. And sometimes she feels compelled to, er, post a reply. It’s really gotten to be a problem. We are serious dog people but stepping over a lake of dog effluvia every morning can be dismaying. It is ever more dismaying when we actually step IN it. So a non-toxic but unpleasant (to dogs) spray was recommended to us to discourage this practice. Now that I understand the whole social media aspect of it, I’m feeling bad about using that spray. Is this like unfriending her canine pals? If she could speak, would she be saying, “Mom! Dad! You’re, like, ruining my life! Now Woofgang Etzler and Fluffy Feinbaum ignore me on the bike path! And who knows what they’re posting about me on the agapanthus in front of the Hinkelmans? Alas, Lily is not usually part of these charming gatherings. Lily is leash aggressive. Which is to say that as soon as you exit the yard with her on a leash, she comes Cujo in the presence of other dogs. Yet as soon as another dog is in our yard and there’s no leashes, she and the visitor are new best friends. It is so odd for a dog who is otherwise calm and sociable. When we have guests, she makes the rounds of everyone’s laps. And let’s not forget “dogar.” A dog can hear the sound of the fridge opening and the crinkle of a package of cheddar cheese no matter where she is in the house or how loud the TV is. Well, now that I understand the whole social media aspect of sniffing and selectively peeing, I’m probably going to cut back on that spray stuff by the gate. Maybe give Lily a little time to build up her friend base again. See if Atilla and Sparkles and Hairy Pawter and Orville Redenbarker will start leaving her messages again. I just hope she appreciates our sacrifice. The hysterical call came in at 9:30 one night. A care giver at the home of a disabled friend was on the other end, so distressed that I could only assume that her client had shuffled off this mortal coil. But it was worse than that. There was a rat in the kitchen. Now let me just say that I can provide no corroborating evidence that this creature was, in fact, a rat and not, say, a field mouse. In every description of the sum-total two (alleged) sightings of this animal, his dimensions have increased, currently assuming the size of a small dog. Hoping to defuse the situation and to allow us to discuss the situation without using the inflammatory “r” word, I named him Bruce. Now, I know that most people are not terribly fond of rodents. The exception would be my dear friend Carol who had a beloved white rat named Snowball. When Carol went through a horrible divorce, Snowball would lick the tears off her face at night as she sobbed into her pillow. One can never underestimate the power of pets to sustain people in times of sorrow. One night last year, I opened my door to find Carol at my doorstep in abject distress. Snowball had been diagnosed with breast cancer. We’ll leave aside the obvious questions as to who treats pet rats (I have enough trouble finding vets for our birds) and how this diagnosis might have been made. Routine mammogram? Self-exam? As anyone with a pet knows, there is virtually no medical treatment for a human that cannot now be done for an animal. So the rodent vet had offered a comprehensive treatment plan. It wouldn’t be cheap. But none of that matters to those of us who are faced with losing a beloved family pet. Bruce, of course, was not a pet. More in the “scourge” category. My personal theory was that Bruce had been looking for a warm dry place to come in out of the week’s torrential rains and had been pleased to find a ready-made fruit bowl banquet on the kitchen counter. Alas, it looked like the care givers might actually quit over Bruce. They had barricaded the kitchen closed from both sides, stuffing towels under the doors, refusing to enter, and were ordering take-out. My first suggestion, of course, was to remove the Bruce Buffet from the counter and put it in the fridge. The next morning – Valentine’s Day – I braved the record-breaking deluge through flooded streets and broken traffic lights to acquire kid-and-pet-safe bait traps at the hardware store and deliver them to our friend’s home. I then called six different pest control places, none of whom could come until the next week and none of whom were willing to just trap one creature. The care giver thought that Bruce might have entered through a hole in a cabinet vent which she maintained should be immediately plugged up by someone other than her. She then thankfully ended her shift and fled the house. But her replacement was even more rodent phobic than she. Not gonna work in a house with a rat. Given that Bruce’s demise had to be hurried along, I called Olof who came over with our should-be-patented kit we’ve affectionately dubbed Furry Varmint Demise: finger-breaking rat spring traps, peanut butter (rat food of choice), cheese cloth (to wrap the peanut butter in), and Brillo pads to stuff in places where you think the rats might be entering (Single Woman Home Repair School hint). We carefully slid the baited spring traps underneath shelves where they would be heard but not seen if they went off. We advised the care givers that we did not provide Deceased Rodential Retrieval Services between 7 p.m. and 8 a.m. I also acquired some sealed plastic containers that could store food items that needed to be left on the counter to ripen. I failed to mention that any self-respecting rat could chew through them if sufficiently motivated. Sometimes illusion is as important as reality. Getting the care givers back in the kitchen was imperative. Days went by and no more signs of Bruce. Tentative activity resumed in our friend’s kitchen. Olof and I began to wonder if this could be a new retiree cottage industry for us. As for Snowball, I was at the grocery store one afternoon some months ago when I got a call from Carol. She weepily reported she was in the vet’s waiting room waiting to have Snowball put down. The treatment plan would likely cause Snowball considerable discomfort with no guarantee of appreciably extending her life. A rat’s average life span is only two years and Snowball’s date of birth was unknown. We cried over a memorial bottle of wine later that evening. And yes, it was really sad. Sorry, Bruce. It all comes down to being invited. 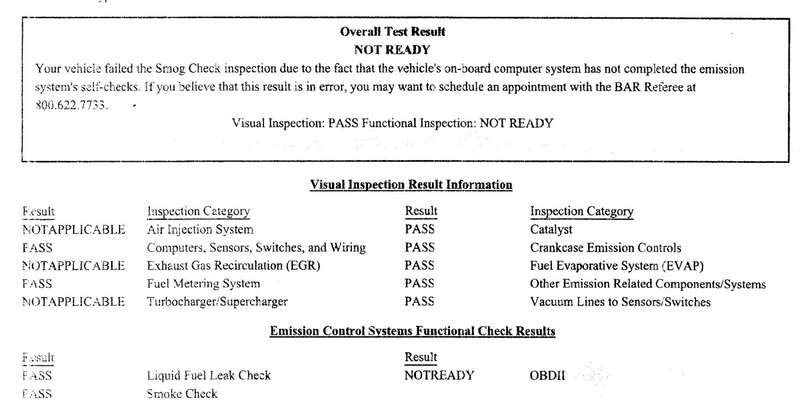 When the service garage manager told me my car failed its smog test because I don’t drive on freeways enough, I was sure I was being scammed. I’d had this experience once before years ago at the now-defunct service station on Pearl and Eads who told me my five-year-old Camry would need $800 in repairs to pass. Dubious, I took it to another garage and it passed without a hitch. This time, the service manager tried to explain to me that their test machine had failed my car on something called OBDII. As best as I could understand – and frankly, I couldn’t understand it at all – when I’d had my battery replaced 18 months earlier, it had re-set a thingamagiggy (not its technical name) that was now causing this problem. The solution, he said, was that I needed to get the car out on the freeway and drive it around for a while (20-100 miles, he guessed) then bring it back in for a re-test. It sounded so ludicrous that I may have said unkind things. In my mind, I could hear these guys laughing hysterically and saying, “She actually fell for it!” I made a mental note to AARP: Alert seniors to the new Elder Battery/Smog Test Scam! A minor detail with this solution is that I do not drive on freeways. As in ever. Hence, my car doesn’t either. I was a reluctant freeway driver even before a seriously impaired driver slammed his Mercedes into our car at 85 miles per hour. A blow-out at 70 miles per hour on I-5 on Christmas Eve in 2015 clinched it. My 6’3” husband avoids driving my car as well as no matter how low and far back the driver’s seat is set, his head is wedged against the roof. But Olof looked up this OBDII thing and amazingly, it’s a real thing. The internet was replete with minutely-detailed instructions on how exactly you should drive your car to fix this problem. But being the internet, absolutely none of those instructions agreed. It reminded me a lot of recipes for perfect popovers, none of which agree either. As you are well aware, the state of California has grown concerned about smog, particularly in Southern California. In response they set limits as to the amount of pollutants that a car can emit and still be licensed. 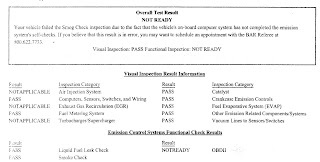 Hence the requirement to periodically take your car to an inspection station and have its exhaust analyzed. However, our government friends determined that these stations could not economically test the car in all operating modes, so they forced car manufacturers to put in sensors that measure pollutants at speeds and operating conditions that the inspection stations can't observe. These sensors connect to an onboard computer which stores their results; probably average values for a past period of time, or perhaps the latest values. This computer is an electronic device and needs electrical power to maintain its memory. Normally that's not a problem as the car's battery provides more than enough power. But you had the battery replaced which momentarily deprived the computer of power and wiped its memory clean. This would also not normally be a problem, but the sensors aren't active at all times. Some apparently only work in specific driving regimes (e.g. speeds above 55 mph). Still not a problem normally because after a day or so of driving, all of those regimes should have been experienced, the sensors reactivated, and the computer updated with data. Only neither the State of California, nor the automobile manufacturers, anticipated granny driving during which the car never exceeds 25 MPH (except on La Jolla Boulevard, where speeds have been observed which, by all rights, should have activated the sensors). The day after you berated the poor service station guys for not being willing to violate state law, I took the car for a spin up Highway 52 and drove it around near Convoy at various speeds. This was apparently sufficient to re-enable all the sensors and cause them to once again report data to the on-board computer. The next morning the car was issued its anti-smog certificate with no problems. 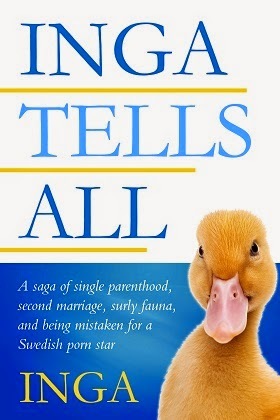 OK, so Olof fixed it. But on behalf of all the little old ladies and freeway phobics in America, I protest. Or maybe it’s just on behalf of little old ladies and freeway phobics in California. As the washer repair guy said about the pathetically low water levels in my new washer, “It’s a California washing machine.” I’ve already written about our California toilets, the mandated low-flow ones you have to flush six times. Now I have a California car which failed its smog test because I don’t drive on freeways enough. But there was one more successful Christmas gift this year. For his seventh birthday, our grandson had asked his other grandparents for a drone. Seemed kind of cool and you could do all sorts of fun things with it, like spy on the neighbors. The other grandparents, being as doting as we, provided one. Cleverly, the other grandparents live in Connecticut so they merely shipped the drone out to Los Angeles thanking their lucky stars that they wouldn’t have to be the ones to actually read the directions and get the thing airborne. But I think they also thought: how hard could it be? I am presuming they thought their daughter would be the one to tackle this task as my son, despite more talents than any human being ought to be allowed to have, cannot change a light bulb. Seriously. When they first married, we would buy our daughter-in-law new tools that she coveted for her tool box. But she is a busy woman. In addition to three young children, she has a YouTube channel that gets 60 million hits a month. Nope, not a typo. But it doesn’t leave her a whole lot of time to be assembling drones. So my son and daughter-in-law hit upon the perfect solution: at Thanksgiving, they brought it down to our house. Our grandson had had what was turning out to be an expensive paperweight for three months by then and was giving up hope that it would ever see sky. But his parents assured him that Baba Olof, an engineer, was the man for the job. While the drone made it down to our house, the instructions didn’t. Such was their faith in Olof that I’m sure they thought he didn’t need them. And normally, like most men, and certainly most engineers, Olof eschews directions as the prerogative of men who wear women’s underwear. But as it turns out, you needed to be a nuclear physicist to operate this drone. Wait. Olof IS a nuclear physicist. Well, okay, his degree is in reactor physics. But he quickly realized this was going to take some serious study and practice which wasn’t going to happen before the end of the hectic Thanksgiving weekend. But it was definitely in the realm of possibility for Christmas up in L.A. So he did the only decent thing: he bought the identical drone for himself. It was a sacrifice, but somebody had to do it. I would point out that he did not do this for our granddaughter’s Barbie Camper which had totally thwarted him the year before. He just let Barbie pitch a tent. Every day in early December, Olof would be checking the steady supply of packages arriving from Amazon. Is it here yet? Despite Olof’s altruistic motives, I wasn’t fooled that there wasn’t a element of Engineer-and-Shiny-New-Toy involved here. Meanwhile, I was placing bets on how fast it would take the L.A. neighbors to shoot both drones out of the sky. But Olof was careful to take ours out for practice in suitably unpopulated areas here in San Diego and sent advance notice to our son and daughter-in-law that given their proximity to LAX, they might pre-screen a suitable flying zone. The Gatwick thing didn’t exactly promote any good will toward small unmanned aircraft. And sure enough, on Christmas Eve day, Olof, our son, and our grandsons went to the designated Suitable For Flying Drones Without Being Blown Out of the Sky by Federal Agents Location, and launched them. It was really fun. But then came Christmas morning and a new bunch of Exciting New Toys showed up. So that may be these drones’ short but exciting lives. Maybe we can see if Amazon is in the market for some like-new delivery vehicles.